La Mom - an American mom in Paris: Beg, Borrow, or...Make it Yourself? Who says craft time is just for kids? Hermès is thinking of the little people. You know, us regular moms who lust after Kelly bags but can't rationalize spending half a year's worth of grocery money on a purse. 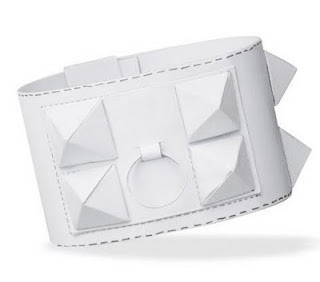 Now you can get some of that Hermès style minus the financial sting with a paper version of their collier de chien bracelet. 4) Hit the next playdate with my personalized Hermès bracelet! Click here to download your own craft for the day. Is it just me or does buying it seem much easier? Hmmmm...point taken. Maybe I'll just skip Kids Krafts and take them on a field trip to the Hermès on rue du Faubourg-St.-Honoré instead? I'm SO not a crafty person, but I LOVE the studs! Last time I was in Hermes was a few weeks ago in Berlin with houseguest from the USA, my friend happened to make a big picture while I watched, rather dejectedly. The sales clerk taking pity on me gave me my own "kraft kit" - a pile of bright orange sheets of paper with "fold here" instructions for making a paper airplane. Meanwhile, somehow, I've managed to get myself on the Hermes guest list for events in Berlin and just received an embossed invite in the mail to attend the Vogue "International Day of Fashion" Cocktail party held, whereelse, Hermes. While the invite has me delighted... it also has me a little terrified. What does one wear to such an event?! ?